When the day began at Disch-Falk Field, the focus was on the past. 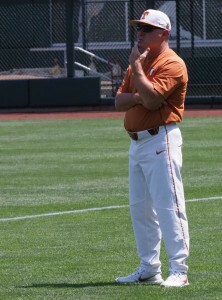 Former head coach Augie Garrido joined Bibb Falk, Billy Disch, and Cliff Gustafson as Texas head coaches to have their busts placed outside Texas’ home diamond. 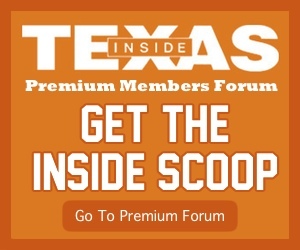 Longhorn athletic director Chris Del Conte even joked with current head coach David Pierce that maybe one day his bust would join the legendary four. The focus on the past continued as several Texas baseball alumni returned for the annual Alumni Game. Longhorn great Roger Clemens earned the start for the “Alumni” team with pitches topping out at 85 mph. 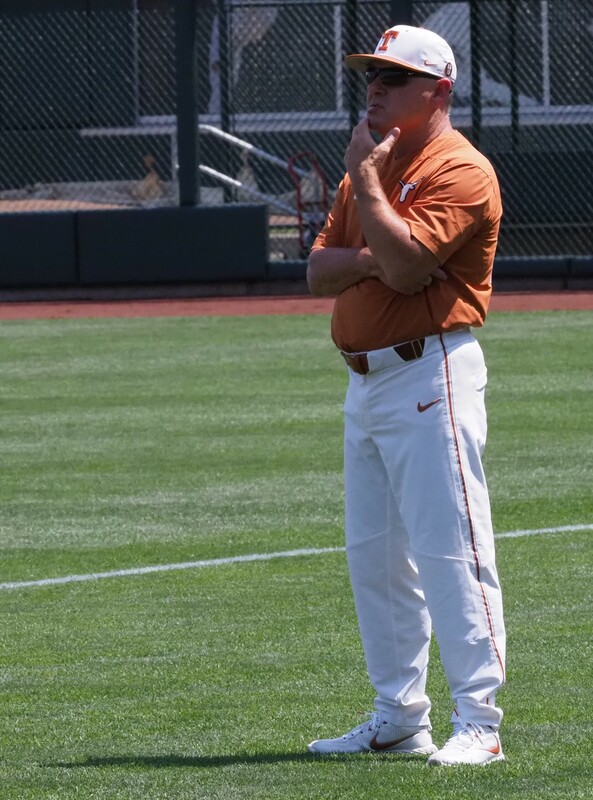 After Clemens finished his only inning of work and the handful of participating alumni played their four innings, the focus shifted to the present 2019 Longhorn baseball team. After an Omaha run in 2018, Pierce is figuring out who will replace key contributors like Chase Shugart, Nolan Kingham, Andy McGuire, Kody Clemens, and several others on the Alumni squad that lost today’s “game” 7-4. Several performances in today’s game gave him a better idea of the current Longhorns he plans to rely on this year. “Great information,” Pierce said after the game. Despite the brief cameo from an all-time great college and professional pitcher, sophomore Bryce Elder’s outing was the best of the hurlers featured. Half of his outs over his 3.2 innings of relief work were strikeouts. The other half were groundouts. Elder had one start in his freshman season and came out of the bullpen in his other 21 appearances. After Pierce stated he was in contention for the No. 1 spot in the rotation, Elder said that has been something he’s striving for since he became a Longhorn. A few other players, some younger than Elder, also made their names known today. With David Hamilton out for the year following a scooter accident, the competition in the middle infield opened up. Senior Masen Hibbeler played shortstop at junior college and left last season as a junior, but can play all over the field. Pierce may continue to rely on Hibbeler’s versatility at second due to the play of talented freshman Bryce Reagan. Another talented freshman that Pierce said might find his way into the lineup is Eric Kennedy, brother of former Longhorn baseball player Nick Kennedy. The IMG Academy product’s chances at a starting spot received a boost when Hamilton was taken out of the equation and when Tate Shaw entered the competition at first base. Even still, Pierce has seen enough from the youngster for him to be needed in the starting ten. First base will affect a lot of positions. Shaw is getting a chance there and Pierce values his experience in the lineup. In addition to Shaw, freshman Peter Geib saw time at first. Senior Michael McCann, who Pierce mentioned as another possibility at the position recently, spent his time at catcher today with DJ Petrinsky nursing a shoulder injury that should not cause him to miss any time. Another option is Sam Bertelson, who started at third for the “Alumni” side today. That spot likely belongs to a slimmed-down Ryan Reynolds when the season starts, but the sophomore from Midland is in the middle of the battle at first base. Bertelson has pop and showed it today with a blast over Comal St. off junior Blair Henley. He’s one of the “12 to 14 hitters that are still really in the mix” to earn a spot in the lineup according to Pierce. As far as the pitching, there was some up and some down. Only two freshmen, Mason Bryant and Owen Meaney, received innings in front of what looked like a small Tuesday crowd. Bryant’s issue isn’t stuff but rather control, while Meaney has a solid one-two combination for a tall freshman. A lot of regular contributors out of the bullpen like Kamron Fields, Matteo Bocchi, and Matt Whelan appeared today with Fields the only one of the three to be scoreless in his outing. Another short outing when to Cole Quintanilla. Quintanilla missed all of 2018 recovering from Tommy John. He walked one in his one inning of work and showed command over several pitches. One pitcher who saw innings late today and was a regular bullpen contributor before losing his role last season was Beau Ridgeway. 2018 simply was not Ridgeway’s season, but Pierce has liked what he’s seen thus far. Following today, Texas has less than two weeks to prepare for the season opener against Louisiana-Lafayette. The team may not be 100 percent game day ready, but they’re getting close. “You can tell it’s not quite opening day but there’s a little bit more energy with the players,” Pierce said.